Father’s Day is a special event to celebrate our fathers and father figures that have shaped the versions of ourselves day-by-day. With all the hard work and responsibilities they have fulfilled, it is a heartwarming feeling to receive a gift as a sign of recognition, love, and respect. 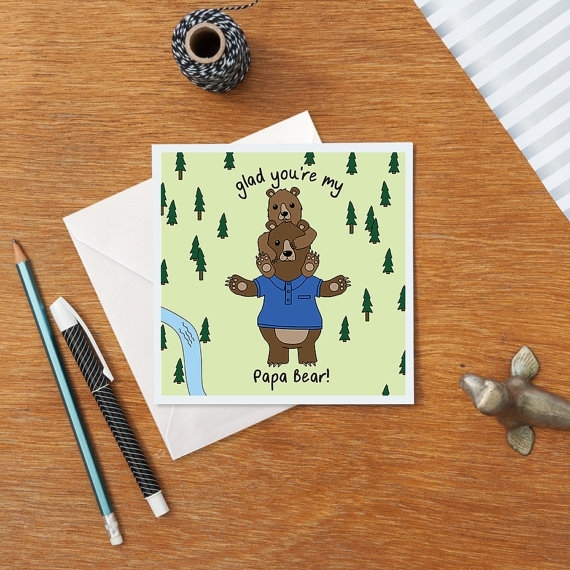 To get you started on your Father’s Day gift ideas, we have a collection of endearing illustrated greeting and thank you card designs below—from cute critters to human subjects depicting a lovable family connection. Don’t forget to enclose your greeting or thank you cards with envelopes to avoid spilling the sweet message it has in store. You may use our samples of free envelope mockups for this purpose. Children always imitate their parents. Their hairstyle, clothing, and sometimes, even their fun catchphrases or antics. If you happen to love rocking the same hairstyle as your father does, then look no further. This hilarious illustration gives off that father and son connection that’s treated with brush like textures to add depth and perspective. 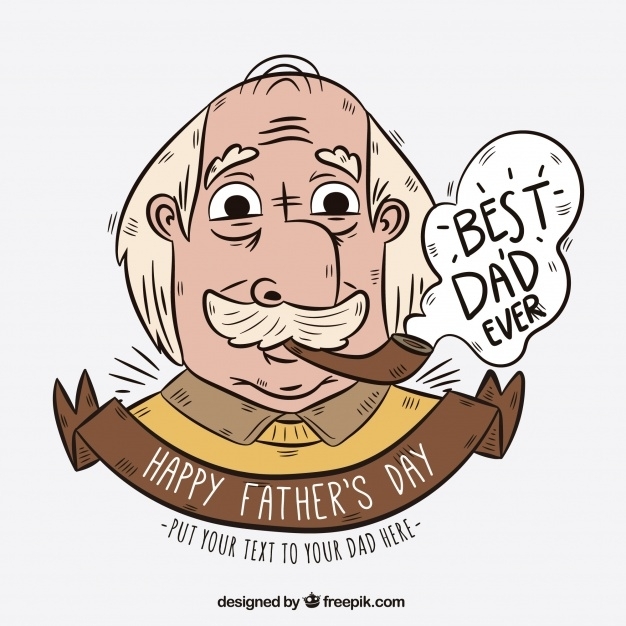 This lovable illustration of an aging father shows content, wisdom, a lifetime of love for his children, and pride for how his children turned out leaving the audience of this card design in an open-ended feeling. This card design uses a simple monochromatic color scheme that is saturated and contrasted. A lot of individuals are widely accepting the LGBT community. In time, the beauty of this acceptance allow people celebrate and own their sexuality as well as embrace young and beautiful children into their lives. 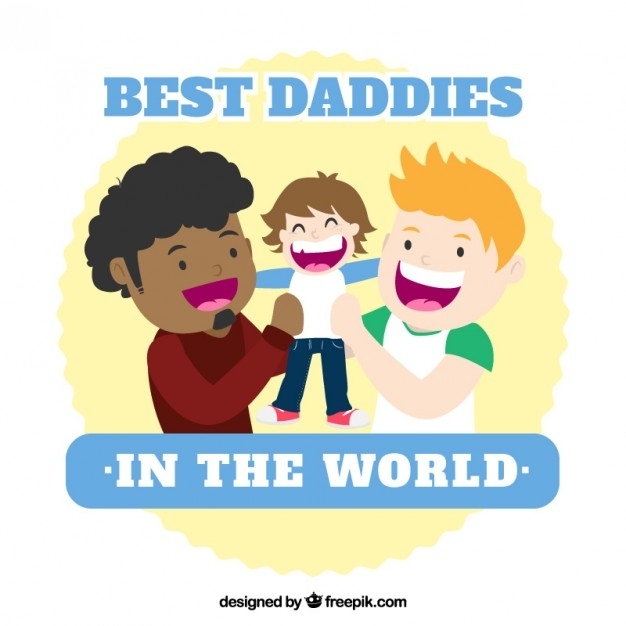 Show your gratitude to your best daddies in the world with this happy and welcoming illustrated Father’s Day greeting card. Fathers definitely know the real struggle of parenting. They’d probably wish they were given an updated version of a handbook or accurate results on the internet on fixing their babies cries to smiles. Say your wishes with this Father’s Day greeting card with a cute illustration of a newborn kitten and its father who’s struggling to get how-to info. Seeing this representation would create nostalgia and appreciation for both your dad and you. It is a struggle to carry a child, especially if both hands are occupied with a baby bottle and a cup of coffee. But somehow, some dads manage to make it cool to be a father. An awesome dad would gladly be impressed with this. 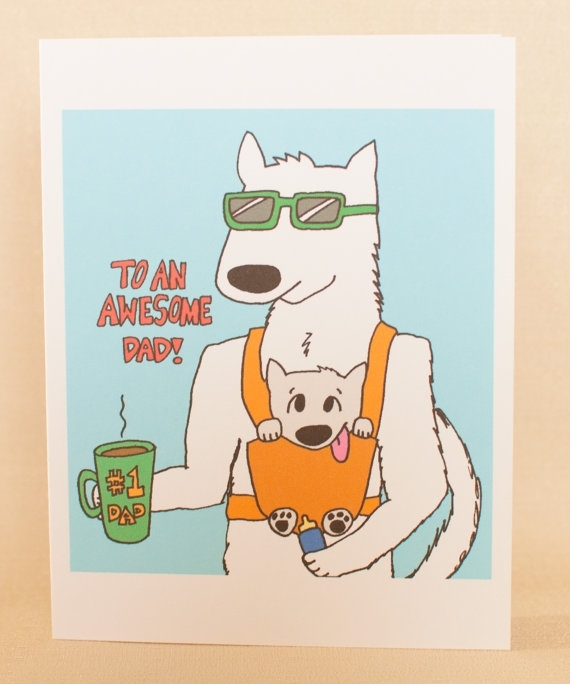 For an extremely appreciative child like you, surely you’ll want to give this Father’s Day greeting card to your awesome and cool dad. Ice pops are definitely invigorating especially in this summer heat. Parenting is a “sweaty” job yet dads are totally chill and look cool while doing it. 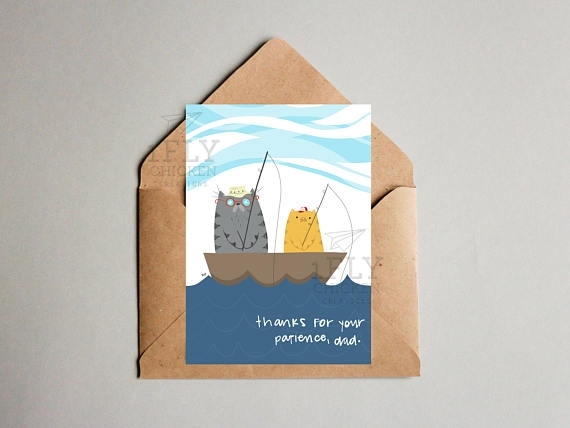 This greeting card design has an amazing soft illustrative take on that situation. It is textured with the impressive gradient in the right places and who is not craving for ice pops with this illustration? This is a perfect choice for the chill dad. Don’t forget to include grabbing some ice pops into your Father’s Day itinerary. Fathers are the best driving teachers. Remember the first time you learned and practiced driving? You were probably having the time of your life at the wheel but your father was staying alert and calm at the same even if he was scared out of his wits. This such an endearing and hilarious illustration of a young adult with an experienced yet terrified father. Well, at least they wore their seat belts. Make your dad giggle at the memory of first your driving lesson with this Father’s Day thank-you card. Surely, this illustration serves a purpose when it comes to illustrating a father’s patience. Patience and keenness in catching fish applies well in parenting. 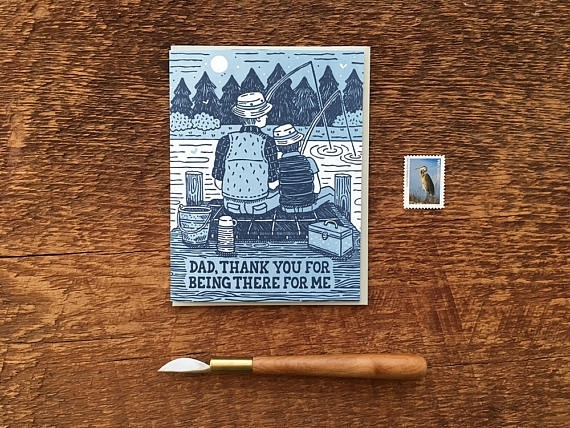 This illustrated Father’s Day thank-you card makes use of soft curves and round shapes to translate flow and the eternal bond that fathers and their children share. Bears are have been imagined to be one of the dangerous animals on Earth. But in cartoons, animations, and illustrations, they are depicted as soft, caring, loving, especially as parents. Similar to the bears, fathers have the same qualities and characteristics as bears; a combination of both soft and strong. Above is an emotional and moving illustrated Father’s Day thank-you card. The subjects speak for that connection they have as father and son. On the technical side, the hand-drawn illustrations translate more drama with its organic lines and shapes. They allow movement as if the waves are flowing, adding textures on the greenery and the monochromatic use of shades of blue as the color scheme translates a calm environment and safety that comes as one of the responsibilities of fathers. 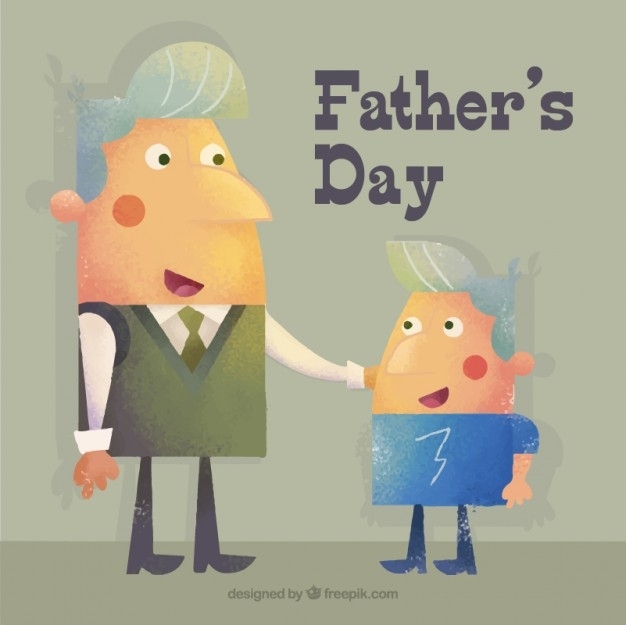 If you are looking for more of greeting cards for Father’s Day, don’t forget to check out our list of Father’s Day greeting cards. Always say your thanks to every individual, be it your friends, family, professionals and in this case, our dear fathers. Remember they are a positive motivating force in your life and them, you are one as well.